BYH is excited to announce we are once again partnering with the Boston Bruins to bring affordable hockey to our community. 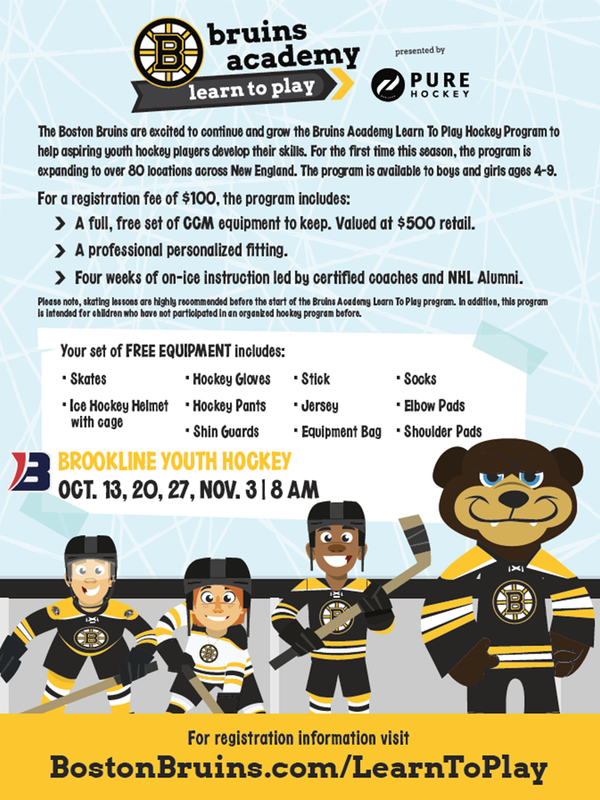 A program which is offered once a year and limited to 60 spots, the Bruins program is offered to brand new players aged 4-9 years old. For $100, players participate in 4 Learn to Play practices and the program also includes ALL EQUIPMENT to keep. For summer 2018, you can sign up with code BROOK5 to get early access for this year's BYH site at Boston University's Walter Brown Arena. Dates for the 4 Learn to Play sessions are Saturdays Oct 13, 20, 27, Nov 3 at 8am at Walter Brown/BU. There is no better deal around in youth activities!! !